All works copyrighted material. Do not attempt to duplicate in tattoo, or any other form. 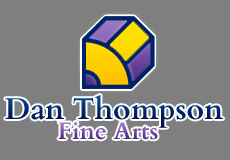 Dan Thomson is a self-taught artist, specializing in pencil and ink graphic art. His work is fantasy in nature, reflecting a magical time when dragons filled the skies and unicorns grazed in the meadow. A Vietnam veteran, Dan arrived in Denver around 1972, and began selling his original artwork to individuals from the trunk of his car. 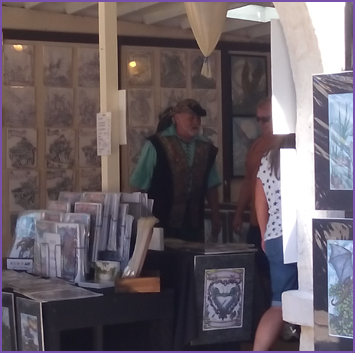 About 1979, he was accepted as one of the original craft vendors in the Colorado Renaissance Festival. Dan and his cat Charlie live in a bustling community west of Denver. They travel around the country, bringing his unique, and sometimes quirky art style to the public. The two of them enjoy cool evenings outdoors, both watching the local wildlife. Dan does most of his drawing while at home in Colorado, and when not drawing or enjoying his cat, his greatest love is fishing! Since joining the festival in Colorado, Dan has been fortunate enough to create graphic designs and wearable art for some of our country's most prestigious festivals. After his first few seasons, he was invited to enter the Arizona Renaissance Festival, the Scarborough Renaissance Festival in Waxahachie, Texas, the Minnesota Renaissance Festival, and the Texas Renaissance Festival in Todd Mission, Texas. 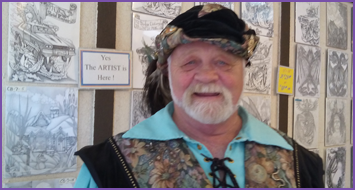 After participating in festivals for over 30 years, Dan decided to retire from the Arizona festival in 2009, and he has announced that 2016 will be his last year in the Minnesota faire. Dan's style is unique because of the detail and power found in his drawings. His specialty is forming a story out of each picture, sometimes hiding intricate details for you to find. His signature is to make the wings of his dragons and fairies transparent. All of his water scenes are "see-through" also. This allows what's behind the characters to be seen. In his shops, he strives to provide something for everyone, which is Dan's goal as an artist. You will find everything from a fantasy world of mountain scenery and wildlife, to a fire-breathing dragon in full flight. He has released some of his earlier work in limited editions. Dan's sincere wish is for all who enter his realm to find something they can enjoy and share with family and friends. He wants his art to be enjoyed now, and always. To you and yours, Dan says HUZZAH! Please check each festivals website for exact dates. "These are so awesome! I can't even believe how intricate they are." All the shading is there. All you have to do is put color to it. The grandkids and I have quiet time and color together with Dan's books. "The way Dan has shaded his pictures, makes it so easy to color and watch them come alive! From black and white, to the colored version is such a dramatic difference. You see so much that you may have missed in black and white. I'm going to use Dan's artwork as therapy for the special needs kids I attend to. Not only to color, but to tell stories about what they see." "I use your coloring books for meditation. One way I calm down." Thank you so much for your artwork Dan. I get one to color and one to save! "I don't really draw or color, but I love his black and white pictures. I like to frame my favorites, and give the rest to the kids to color. They love it!"